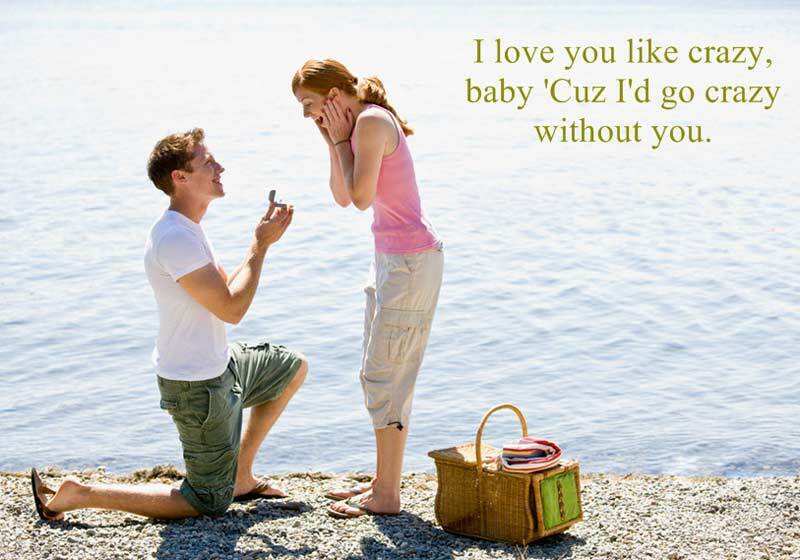 Whatever you want to make a love proposal or marriage be sure to express your thought perfectly and try to make it fantastic. 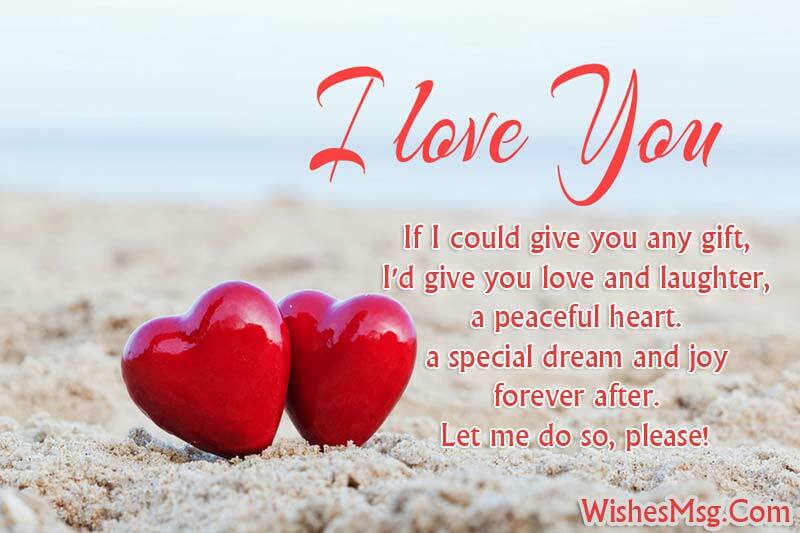 Really, expressing the true feelings of love to the desired person could be tough if you don’t have the right ideas about how to propose a girl or boy. 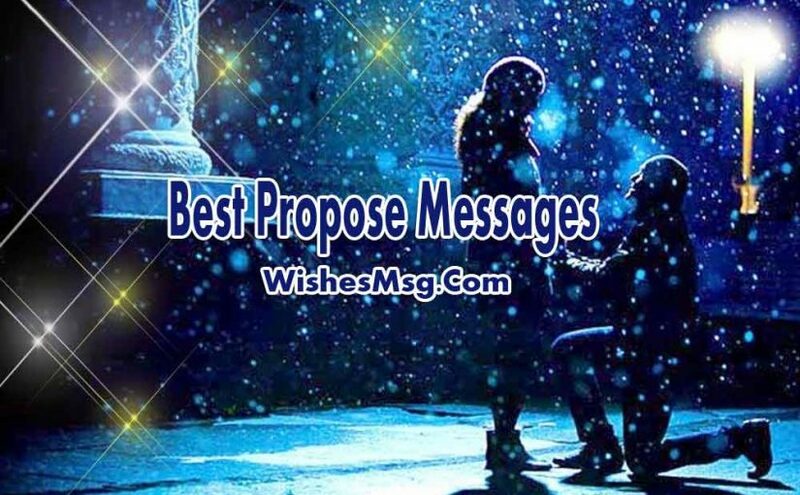 Don’t worry so, here we have pulled together some best Propose Messages and romantic phrases for proposal which will help you to get experienced the most romantic ways to propose your love. Let’s say that you wanna grow old with her/him and share the rest of your lives together. Get ready to make it ‘Yes’ and send these propose messages to your partner to be from this post that could bring you a positive answer. My heart was a desert until you came and watered it with you love. Let’s spend the rest of our lives together pulling the weeds and enjoying the blossoms. With that ring, I gave you my heart. I promised from that day forward, you would never walk alone; my heart would be your shelter, and my arms would be your home. Every time I’m with you I cannot avoid feeling something very special in my heart. The only reason is I would love to be with you throughout the day and make everything possible to make you happy. Would you be my girlfriend? Let all my happiness be yours, all your sadness be mine. Let the whole world be yours, only you be mine! I can’t imagine growing old with anyone else, nor do I want to. Honey is my favorite food-is it your favorite too? Come live in Hundred-Acre Wood so I can be with you. Though I have lots of things to say, but my words are hiding from me and I cannot express. A simple thing I want to say is I love you today and always. You are the only one who understands me even more than myself. You are the only one with whom I can share everything, even my personal secrets. I want you to be with me always. I love you. So many times I thought I would never find someone to love me the way I needed to be loved. Plz Come into my life and showed me what true love really is! The story of our love is only beginning. Let’s write our own happy ending. Keep me in your heart, but not in your mind, because I always want to stay with you, not want to be in your sweet memory. I love you the most in the world. I wanna marry you because you’re the first person I wanna look at when I wake up in the morning and the only one I wanna kiss goodnight. Because the first time that I saw these hands, I couldn’t imagine not being able to hold them. But mainly when you love someone as much as I love you, getting married is the only thing left to do, So will you marry me? Here’s my love, take it. Here’s my soul, use it. Here’s my heart, don’t break it. Here’s my hand, hold it and together we will make it forever. The best place for me is in your heart. Can you keep this place for me all through your life? I know there is no better place for me so can you be the love of my life? Will you be my valentine? You deserve the very best, someone who will back you up without limits, let you grow without borders, and love you without end. Will you let me be the one? When I look into your eyes, I can see a reflection of the two of us and the life I hope we’ll share together. I know you’re the only one I want to share the rest of my life with. Look, I guarantee there’ll be tough times. I guarantee that at some points, one or both of us is gonna want to get out of this thing. But I also guarantee that if I don’t ask you to be mine, I’ll regrate it for the rest of my life, because I know, in my heart you’re the only one for me. What does it take to get your attention. I love you. How can one heart be so in love that even though you can’t see it with your eyes, but with your heart. My life is wonderful because you are with me, you make me happy even if I feel sad and low. Your smile lightens up my life and all the darkness disappear. Your love has made me crazy. I will love you till the end of my life. And I want to be with all my life. I love you! I’ve tried to tell you personally, but I get nervous and I have trouble finding the right words. What I say is that I love with all my heart and it would be perfect if you accept to be my boyfriend. When I met you, I knew I’d met my match. It was only a matter of time until we arrived at this moment. How it turns out is all in your hands. All I wanted was someone to care for me, all I wanted was someone who would be there for me, all I wanted was someone like you, will you be mine? I believe that if we’re lucky enough to have found each other in the first place, we’re worth betting on for life. Will you take that gamble with me? Here and now, let love express on my behalf what I feel for you. I love you more than love itself can offer. You’re my angel. There are many ways to be happy in this life, but all I really need is you. My feelings are all new and you are the reason. You make me think about yourself all the time. Even my heartbeat says that I love you. You are the man of my dreams and you give me the reason of life. I love you! So will you, many years from now still take my hands in yours? Will you, in years to come, allow my hands to creep to yours? Let’s put our hearts into each other’s hands for life. I’m opening an emotional bank account for you sweetheart, so deposit your love in it and you will get the interest. Be mine! All say love makes you special, but for me, it is you. All say light can drive out the dark, but for me, it is your smile, all say God gives us life, but in my case, it is your love. 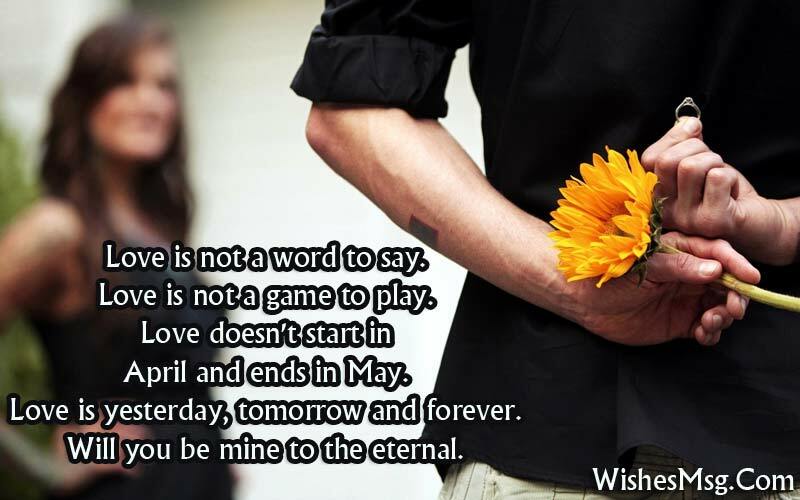 I want to be with you forever. When I think of the future, I like to picture us as two trees planted side-by-side, our roots growing together more firmly as the years go by, and our children sprouting like seedlings around us. We’ve known each other for long time but I never really noticed all the magic in your eyes, I’ve been around you a thousand times before and you’ve always been a friend to me, but now I’m wanting more… think about it! I don’t want anyone else to have your heart, kiss your lips, be in your arms, be the one you love. I don’t want anyone to take my place. Please never let it happen and be mine forever. The day I will love another woman in my life is the day you become the mother of our lovely daughter. Will you want to share this feeling with me? Will you marry me? When the love grow inside your heart and you desire to make it happen with whom you like then gather courage and just let him/her know honestly what you feel deep inside. Take ideas from these propose message to write your own and don’t lose hope cause every precious things take hardship and cost value to get achieved.